Rex Burkhead started the week with his right foot in a walking boot, but nothing was going to keep him out of this game. After quarterback Taylor Martinez tweaked his left ankle on a first-quarter run, offensive coordinator Tim Beck told Burkhead that he would be the main man. Burkhead told coach Beck, "whatever the team needed to do, pound the rock and throw passes when we needed to". Burkhead pounded away at Iowa's defense 4 or 5 yards at a time and looked like his old self after being held to a season-low 36 yards in last week's loss at Michigan. He finished the game by running for 160 yards and a touchdown on a school-record 38 carries helping the Huskers to a 20-7 victory o over the Iowa Hawkeyes on Friday. With Nebraska having joined the Big Ten this year, Friday's game was long touted as the start of a natural rivalry. Iowa is Nebraska's closest Big Ten opponent, and the farm states split by the Missouri River share a passion for football. The universities further billed it as the inaugural "Heroes Game" and honored "citizen heroes" from each state at halftime. This latest win kept alive the Huskers hopes of landing a berth in the Capital One Bowl, if two Big Ten teams are invited to BCS games, or the Outback Bowl. Huskers hang close in the first half, but the Wolverines pulled away in the second half for a 45 to 17 victory on Saturday. 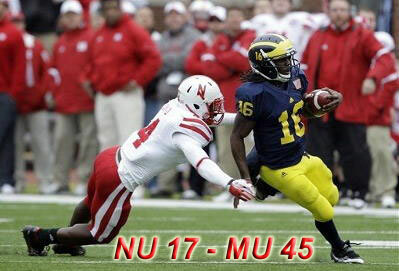 Denard Robinson proved to be too much for the Blackshirts as he threw two touchdown passes and ran for two more scores. Once again the Huskers struggle against a team with a running quarterback. The Robinson-led offense did whatever it wanted. The Wolverines were stingy on defense and outplayed the Huskers on special teams. With this loss the Huskers have lost any hope of playing in the Big Ten's first title game. Burkhead was held to a season-low 36 yards and didn't score for the first time this season. Martinez was 9 of 23 for 122 yards with a TD and a fumble, one of a season-high three for the Cornhuskers. The Huskers' first game at Michigan Stadium since 1962 was simply miserable and it might've reminded them of their Big Ten debut this year, a 48-17 loss at Wisconsin. This weekend the Huskers get some home cooking as they play their final game of the regular season against the Iowa Hawkeyes. Ending the worst week in school history, Penn State couldn't overcome a 17-point deficit and was stopped short on a fourth-and-1 late in a 17-14 loss Saturday to Nebraska. Rex Burkhead had his sixth 100-yard rushing game of the season with 121 yards on 25 carries. Taylor Martinez added 56 yards on the ground and was mistake free through the air with 143 yards passing. Kelly Bell led the Husker receivers with four catches for 42 yards, and Kyler Reed added three catches for 40 yards. A week that began with the arrest of former Penn State defensive coordinator Jerry Sandusky on child sexual abuse charges ended Saturday with Penn State losing in its first game of the post-Joe Paterno era. The winningest major college football coach ever was fired Wednesday. Throughout the game the crowd roared "We are ... Penn State," the signature State College cheer, but it wasn't the same and may not be for some time to come. The victory over Penn State marked the highest ranked team Nebraska has defeated away in a decade. Next weekend doesn't get any easier as the Huskers travel to Ann Arbor Michigan to play the Wolverines. The Huskers' running game and defense were most to blame for this weekend's loss to Northwestern 28-25. Not a good day for the Huskers' offensive line either. Northwestern was in Nebraska's backfield way too often, tackling Rex Burkhead five times behind the line of scrimmage. The Wildcats recorded 11 tackles for a loss in the game. The option game continued to struggle as well. One had a feeling this wouldn't end well for Nebraska when Burkhead fumbled inside the Northwestern 5-yard line in the second quarter. The Huskers seemed to have a handle on the Wildcats quarterback Dan Persa, but Kain Colter presented more challenges. Northwestern's quick pace early in the game seemed to bother the Huskers as well. The Huskers defense couldn't stop Northwestern when it desperately needed to. On their game-clinching touchdown drive, they ran the ball up the middle, repeatedly, and we had no answers. On this Saturday the Wildcats were the better team and The Huskers didn't play a good game. We need to get it back quick before we roll into the emotional hornets nest that is Penn State. The Michigan State game this weekend was very important if the Huskers wanted to stay in the race for the Legends Division. The question most Husker fans had was whether the Husker's defense could play well enough to defeat the Spartans. The Husker defense proved up to the challenge delivering a 24-3 victory in Lincoln. The Husker secondary set the tone early by picking off Michigan State to set up Nebraska's initial touchdown run by I-back Rex Burkhead. Burkhead continued to be the key offensive threat by scoring three touchdowns and accumulating 156 total yards. The Spartans were held to fewer than 200 total yards and just three points. The credit for this victory goes to the Husker defense, which kept the Spartans out of the end zone. The Huskers control their own destiny but must win four tough games to win their division and play in the Big Ten championship. Nebraska had to have this game, but by no means have they sealed up a Legends title. This was a big victory for the Huskers and one good enough to earn the defensive players their Blackshirts. The Huskers had their most dominant effort of the season taking a 34-0 halftime lead on its way to a 41-14 victory at Minnesota. Most of the damage in the first half came from Husker wideout Kenny Bell, who had an 82-yard touchdown on a reverse. Rex Burkhead rushed for 76 first-half yards and a four-yard score. Brandon Kinnie nearly went the distance on a 61-yard pass. Fullback Tyler Legate even hauled in a touchdown pass. The Defense even got into the act which included a fumble return for a touchdown by defensive back Austin Cassidy. At halftime the Huskers put up 330 total yards to Minnesota's 88. In the second half the Gophers used a flea-flicker to set up their first touchdown. The Huskers answered with a 17-play touchdown drive capped off by Aaron Green to chew up most of the third quarter. The fourth quarter featured an appearance by Husker backup quarterback Brion Carnes and a garbage-time touchdown drive by Minnesota in the closing minutes. The Huskers won their sixth game of the year to become bowl eligible. They also got their first road win in Big Ten play. Next Saturday's home game against Michigan State may go a long way in deciding the Legends division race. Go Big Red! If Saturday night was any indication, the Nebraska vs. Ohio State match up has the makings of a good rivalry. The Huskers were manhandled and outplayed in the first half by the Buckeyes and they seemed be on their way to a win when they took a 27-6 lead in the third quarter. Just as Husker Nation was ready to pull the plug on what little life the Huskers had left, LB Lavonte David came up with a game changing fumble that led to the Huskers' first touchdown. Helped by an injury to starting Buckeye quarterback Braxton Miller, the Husker defense stiffened substantially and came up with turnovers. QB Taylor Martinez and RB Rex Burkhead took it from there in a unbelievable 4th quarter leading the Huskers to a 34-27 victory. The Husker offense rolled up nearly 300 yards and four touchdowns in a quarter and a half. The 21 point comeback was the biggest comeback in Husker history. This was also the first conference win for the Huskers and may have saved the season for the Husker Nation. The Huskers now have an extra week off before they go on the road to play the Minnesota Gophers and they may need it to recover from this one. The Husker Nation has been worried about the Secondary and Quarterback play over the first 4 weekends of college football. They were both painfully exposed on national TV Saturday night. As a result, the Huskers were thoroughly dismantled in Madison 48-17. The Huskers looked like they were going to compete in this game early in the second quarter when they took a 14 to 7 lead, but it all came crashing down after that. Taylor Martinez threw three interceptions which the Badgers turned into three touchdowns. The Huskers secondary seemed confused and were often out of position giving up 250 yards through the air. With the Huskers help, Wisconsin was able to run off 34 unanswered points. The Badger's quarterback Russell Wilson was all that he was hyped to be escaping the Husker's defense time and time again and turning broken plays into big gains. The Badgers rushing game pounded the Huskers into submission late as the Huskers latest nightmare was turned into reality. The Huskers don't have long too heal their wounds as Ohio State comes to Lincoln next week hungry for a win. What most people saw as a tune up game before the Huskers started big ten play became a little uncomfortable before the game began. Wyoming entered the game with a undefeated record and the crowed was fired up. Throw in the tremendous elevation in Laramie mixed with some Husker injuries and inexperience and all of a sudden this game got a little more interesting. The Huskers pounded the Cowboys with the run game behind running back Rex Burkhead rushing for 170 yards and 2 touchdowns in a 38-14 victory. Taylor Martinez was very inaccurate early spraying the ball and missing wide open receivers. He eventually calmed down leading the Huskers passing for 157 and a touchdown while also rushing for 47 yards and a score. The Blackshirts defense still looks very vulnerable, especially in the passing game. Their inability to get pressure on the freshman quarterback and a secondary that looked lost and confused at times gives Husker fans a very uneasy feeling going into next week's match up with the Wisconsin Badgers. The Huskers still need to improve on defense and in the passing game if they hope to come out of Camp Randall Stadium with a victory. The Husker offense was the story of the day as the Blackshirts struggled in a 51-38 victory over the Washington Huskies. Quarterback Taylor Martinez accounted for 237 total yards and three touchdowns while Rex Burkhead rushed for 120 yards and two touchdowns. The difference in the game may have been two turnovers by Huskies quarterback Price and none by Martinez. The Huskers did a good job of spreading the ball around. Five Husker ball carriers ran for 30 yards or more as the Huskers rushed for over 300 yards. Seven Huskers caught passes in the game as well. True freshman running backs, Aaron Green and Braylon Heard, both carried the ball nicely in the second half. Rex Burkhead was the work horse rushing for 120 yards and 2 touchdowns. The defense played well in spots, but wasn't as dominate as one would expect. The defensive line had trouble getting pressure on the Huskies quarterback consistently. The linebackers played better than a week ago, but still had trouble at times against the run. The secondary still looks lost at times without CB Alfonzo Dennard. His return is anxiously awaited. The Huskers take their show on the road next week to Laramie to play the Wyoming Cowboys. In front of an NCAA-record 313th consecutive sellout (85,101 attendance) at Memorial Stadium the Huskers found themselves in a dogfight against the Fresno State Bulldogs. Big plays for the Huskers were very key to the 42-29 win over Fresno State on Saturday night. The biggest came in the fourth-quarter when freshman Ameer Abdullah returned a Fresno State kickoff 100-yards for a touchdown. With 2:02 in the fourth, Taylor Martinez scored on a 46-yard touchdown run and put the game out of reach. Martinez finished with 385 yards of total offense - the second-best total of his career and the eighth-highest mark in Nebraska history. It was his seventh career 100-yard rushing performance, and his second-best passing total of his career. Sounds great but for those at the game and for others watching on TV this wasn't a convincing performance from the Huskers on either side of the ball. We need to get better quick with the Washington Huskies coming to town next weekend. The Huskers kick off their Big Ten season with a convincing 40 - 7 win over Tennessee at Chattanooga on Saturday at Memorial Stadium. QB Taylor Martinez looked like the Martinez from early last season rushing for 135 yards and three touchdowns. The Blackshirts should give most offenses fits with a very talented and deep defensive line led by Jared Crick and Cameron Meredith. There are two players to keep an eye this season. Newcomer Safety Daimion Stafford, a hard hitting safety that by seasons end will have opposing receivers and running backs hearing footsteps and ducking for cover. While, true freshman converted quarterback to wide receiver Jamal Turner has the speed and talent to be a real game breaker for the Huskers this season. The schedule becomes a little more challenging next week as Fresno State comes calling next Saturday evening.